After 25 years in kitchens, I developed stiff joints in my hands. After 15 years of creating, I developed Secret Spice Remedy, which relieves my arthritis symptoms. This bold blend adds flavor, anti-inflammatories & nutrition to your food. That's the Secret. Great value at this new low price! Standard retail 19.95! 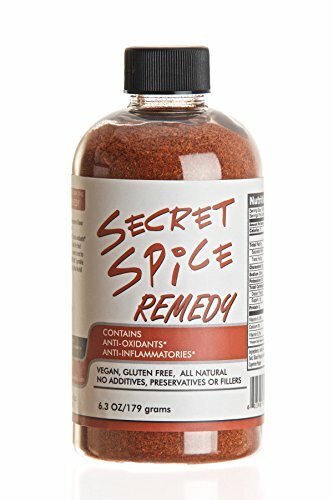 Secret Spice Remedy is an innovation that adds Fabulous Flavor and Nutrition to the food you already eat! Created through years of research, this unique blend of premium spices contains anti-inflammatories, anti-oxidants, vitamins. Use it in all your favorite recipes as a replacement for salt & pepper; sprinkle on eggs, veggies, salads, fruit,rub on grilled meats, smoked ribs & seafood. Innovative, Flavorful Spice Blend that adds anti-inflammatories to your food! We bridged the gap between a Spice Blend and a Dietary Supplement! Anti-inflammatory, Anti-oxidant, Vitamin C, A, minerals and vitamins. Non-GMO, Gluten-free, Raw, Paleo, Vegan, Whole30, A Healthy Alternative to Salt. If you have any questions about this product by Secret Spice, contact us by completing and submitting the form below. If you are looking for a specif part number, please include it with your message.